Getting people to eat their veggies is no small feat. All sorts of juicers, blenders, powders, and even ready-to-drink bottles have been created to help people overcome their disdain for the humble green produce. Despite the fact that the pros of vegetable consumption (longer life expectancy) far outweigh the cons (poor taste), some people just refuse to embrace vegetables in any form, no matter how much cajoling and convincing you attempt. There’s still hope for these people though, and it comes in the form of a true superfood blend that tastes so good you wouldn’t think a vegetable was anywhere near it.. Performance Greens from Magnum Nutraceuticals combines the best health benefits from green vegetables, PLUS digestive enzymes, essential fatty acids, and even phytonutrients from berries! Typically, you use these in a protein smoothie in the blender. It often helps to add a bit of fruit, cinnamon, and/or peanut butter to add to the taste, so long as they fit your diet. It’s nearly impossible to placebo-control a study on the entire product itself, since the subject group will obviously know they’re getting greens, but we definitely feel better when taking greens powder. Magnum has scoured earth to find the most nutrient dense fruits, vegetables, and oils that have been used to increase energy and provide stress relief. Performance Greens contains six unique blends each precisely compiled to help you feel younger, move better, and increase vitality. Performance Greens contains 6 unique blends, all transparently dosed to support your health and further your gains while outside the gym. Performance Greens starts right off with the most important feature of a greens formula… the GREENS! Looking at the ingredient list to the right, you’ll see all sorts of interesting fare that you wouldn’t likely encounter on even the most trendy restaurant menu in town. 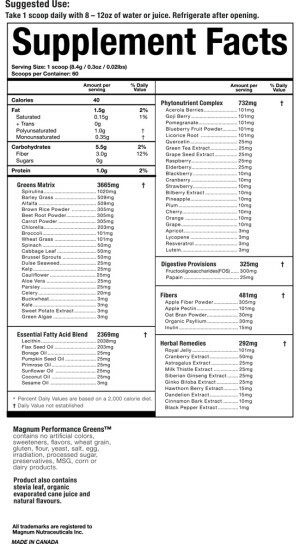 Other interesting ingredients you’ll find include aloe vera and chlorella. The latter is another type of algae that’s been shown in clinical trials to improve markers of hyperlipidemia and hyperglycemia, and protect against oxidative stress. You’ll also see standard veggie fare like broccoli, cauliflower, sweet potato, and celery to round out the comprehensive profile used to formulate the Greens Matrix. While many people are concerned about getting the right amounts of saturated or unsaturated fats, not enough are focused on getting their essential fatty acids (EFAs) in each day. EFAs cannot be synthesized in the body and must be obtained from food. These two crucial fats are alpha-linolenic acid (an omega-3 fatty acid) and linoleic acid (an omega-6 fatty acid). While fats have been demonized in recent times and often avoided for a long time during the 90s, they are absolutely vital to your health and well-being. Even a 2 week deficiency in EFAs has been shown to negatively impact growth and development parameters. Lucky for you, Magnum has taken care of the dirty work and sourced the most dense foods that contain these two important fats so you don’t have to go scavenging the local farmer’s market. These don’t disclude you from taking fish oil or eating fish, however. Despite ALA being an omega-3 fatty acid, it does not convert well to DHA or EPA, the two key omega-3s that are important for cardiovascular health. Performance Greens helps take care your your insides and outsides. Need evidence? Just look to Magnum’s impressive line of female athletes. To save you from having to buy a greens formula and a berry or “red” formula, Performance Greens also includes a Phytonutrient Complex made up of another group of superfoods that consists of various fruits. Sure, everyone thinks of blueberries, strawberries, and pineapple as all-stars of the fruit world, Magnum includes some lesser known yet equally nutritious foods like Acerola Berries and various extracts such as grape seed extract and quercetin. Acerola berries are fruits rich in vitamin C, vitamin A, and niacin often used in the preparation of ancient forms of medicine. Research into the berry indicates it may reduce inflammation and mitigate obesity-related defects. Quercetin is a heavily researched bioflavonoid found in a wide array of fruits and veggies, including apples and onions. It works synergistically with green tea catechins (also found in this complex) to improve the absorption and bioavailability in the body through the inhibition of catechol-o-methyl. Clinical trials conducted on Quercetin found it increased exercise endurance through enhanced production of mitochondrial biogenesis in the muscle cells. Interestingly, in the research study that showed fruit-and-vegetable eaters living longer, fruits actually fared a bit better than the vegetables! 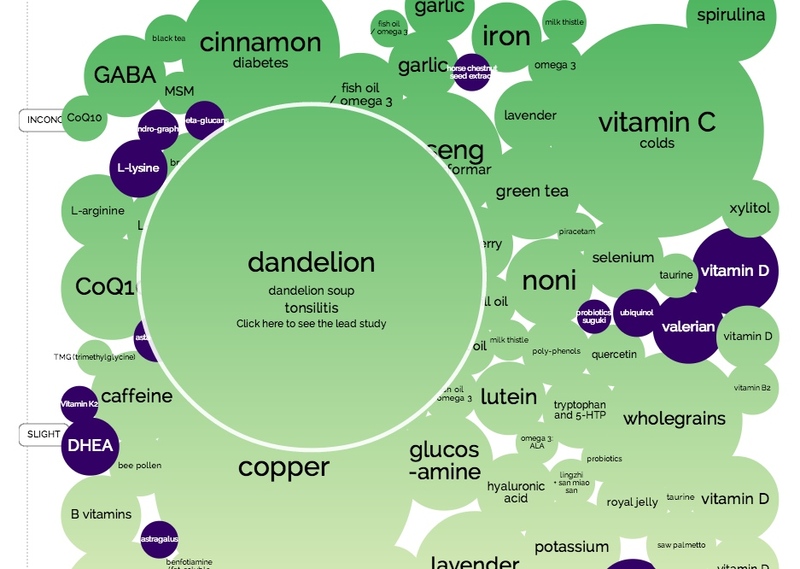 Nobody’s sure why those were the results, but the antioxidants mentioned above certainly may have something to do with it. 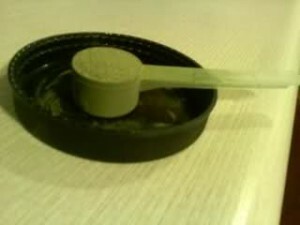 This is what a scoop will look like. Add to blender with a banana, berries, protein, cinnamon… and boom! Some can juts down it with water, but it’ll definitely taste ‘grassy’. Image courtesy am1991. You can eat as much spinach as Popeye did, but if your body’s GI system is out of whack, all that good you think you’re doing will go to waste. Years of imperfect dietary habits, plus the increased use of medications can lead to the degeneration of the healthy bacteria that resides in your stomach and intestines. Missing out on these beneficial bacteria negatively impacts your body’s ability to properly use the vitamins, minerals, and phytonutrients contained in most of the foods we consume each day. To help improve your gut and ensure you’re making the most of the superfoods contained in Performance Greens, Magnum includes Papain and Fructooligosaccharides (FOS). Papain may be more familiar to those of you “in the know” about supplementation as the primary enzyme in Papaya. However, most probably have never seen FOS before. Fructooligosacchariades are naturally occurring sugars found in chicory, onions, asparagus, wheat, and other fruits, vegetables and grains. It’s sometimes used as a low-calorie alternative sweetener, but also has been investigated for its role in human digestion, since it is considered a prebiotic. A healthy gut will go a long way to improving GI distress, eliminating excessive bloating and gas, and optimize nutrient absorption and utilization by the body. Dandelion extracts help dry the body out and improve glucose uptake in skeletal muscle. Everyone knows the importance of fiber in the human diet. It helps keep things running smoothly and regularly so you don’t have resort to various OTC option to keep you regular. The problem is, many times people with poor diets have trouble getting in the RDA amounts. Not to worry though, as Performance Greens a blend of soluble and insoluble fibers from foods like apples, oatmeal, and psyllium husk to help keep things moving on schedule. Last but not least, Performance Greens includes various herbs known for improving human health across a wide spectrum. Milk Thistle supports liver detox by enhancing DNA synthesis and protein synthesis in the liver. What’s more, a clinical review of milk thistle found it was beneficial in treating alcoholic liver cirrhosis and alcohol poisoning. Astragalus is another herb widely used in Ancient Chinese medicine. Current research shows that when combined with exercise, astragalus improves endurance and reduces markers of muscular damage like blood lactate and ammonia. [12,13] Furthermore, Astragalus helps fight inflammation and support the body’s immune system. 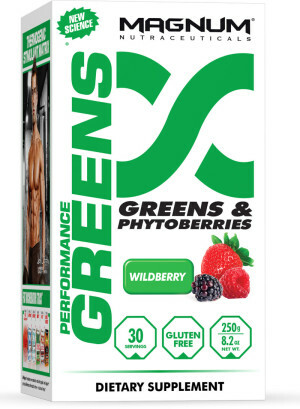 To help you reach your daily recommended ~4-5 servings of fruits and vegetables in one convenient, and tasty, offering, Performance Greens comes in the refreshing Wildberry flavor. Take one scoop each day with 8-12 oz of water or juice and be on your way, no more chopping, dicing, or roasting to get your veggie quota filled. How many servings of fruits / vegetables is this? In the mortality study performed that analyzed fruit and vegetable eaters, they considered about a 77g portion to be a serving. It’s tough to determine how many “servings” of fruits/vegetables are in Performance Greens, since they’re concentrated, but we would put it at two – one for the fruits, one for the vegetables. In that study, they found that individuals who ate up to 5 servings per day flat-out lived longer on average. This means that if you make a smoothie with Performance Greens inside, you really only need a few more servings of vegetables to go with it. And 77g is not that much – basically you’re talking about a decent-sized spinach salad and an apple and you’re about set for the day. After a month of doing this, we promise that you will just generally feel better. Vegetables don’t deserve the bad rap they get from the kids. Sure everyone has come across some tragic looking green beans or rancid boiled cauliflower, but the popularity of cooking has jettisoned those 1950s-cooking habits. Today people are finding fun and unique ways to serve greens that make them tasty and healthy. But for those who refuse to be a veggie convert, or those days you’re having a tough time getting in enough veg, Magnum’s Performance Greens is a convenient and tasty way to make sure you get your daily needs, and your brain and body will thank you for it. 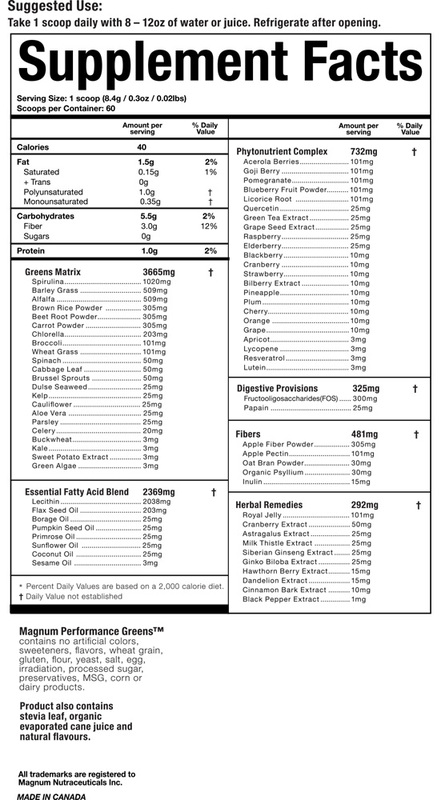 No Comments | Posted in Supplement News | Tagged Fibers, Fructooligosaccharides, Fruit, Green Tea, Greens Powder, Magnum Nutraceuticals, Milk Thistle, Phytonutrients, Spirulina, Superfood, Vegetables.